The National Capital Education Tourism Project (NCETP) will host a 5 day familiarisation tour of Canberra in February. This is a perfect opportunity for yourself or your staff to learn more about planning an excursion to the National Capital. Please note that it is your responsibilitiy to arrange your own travel (flights) to and from Canberra. Available places are limited to 20. A limit of 2 representatives from each organisation applies and preference will be given to those who have not attended in the past. During the program, National attractions and Acommodation venues will be visited as well as School Accommodation venues. You will have the opportunity to meet and talk to booking staff, learn about booking procedures and education programs available. Please email admin@ncetp.org.au for more information. 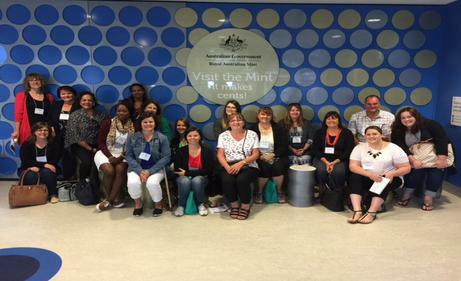 Participants from the 2016 Tour Operator Familiarisation Tour arriving at the Mint.